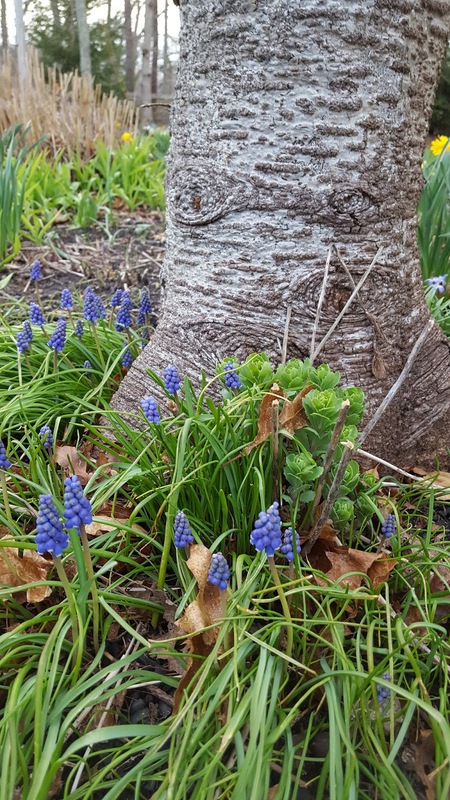 Grape hyacinth. That's what they are called. Those little spiky flowers made up of numerous bell-shaped blooms. A minuscule bunch of grapes the perfect size for a fairy. I have to crouch down to inspect them. Val has planted them in clumps so that when they appear it's as if there is a whole herd of purple flowers. Tiny spikes, little elfin hats that always remind me not of big bunches of juicy grapes but instead of deep, dark blackberries. 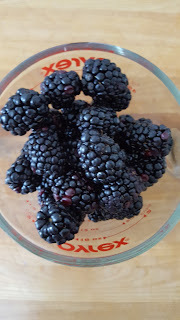 And when I think about blackberries, or any kind of berry for that matter, I always begin to dream about jam. Of course, most of the time, jam needs a vehicle. (When I'm acting civilized instead of eating the jam out of the container by the spoonful with the refrigerator door wide open.) 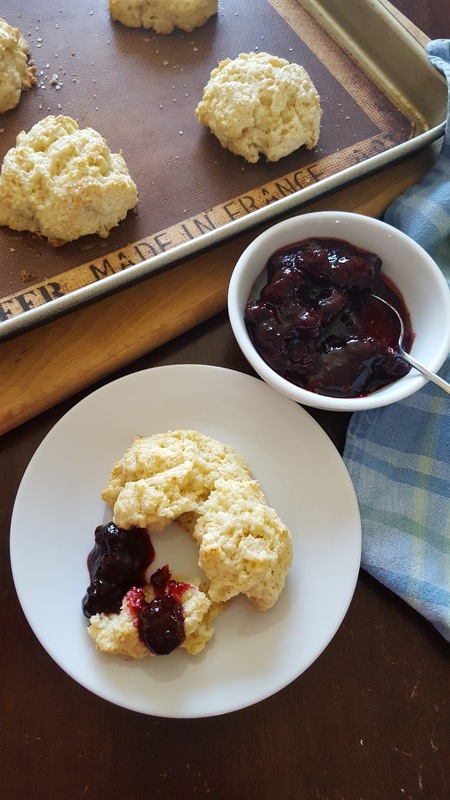 And my favorite jam landing pad other than homemade toasted white bread baked by Val, herself, is a freshly baked biscuit, or it's free form cousin, the scone. So, last Sunday morning, the day after mine and Ava's girls' night, I decided that we needed to eat scones for breakfast.Vanilla scented, fluffy, light and topped with crunchy sugar crystals. Hot out of the oven, crispy outer edge. The soft inside ready to absorb the sweetened berry juice dotted with softened berries. 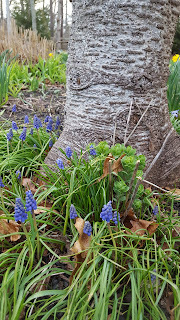 Celebratory blackberry jam I made to welcome the long awaited April arrival of the grape hyacinths running along the stone walkway that leads to Val's porch. Combine all ingredients except pectin in a medium size saucepan. Heat on medium-high and stir occasionally until sugar melts and mixture begins to bubble. Add pectin and continue to stir until mixture thickens (about 5 minutes). Skim off and discard any white bubbly film that forms over the top. Lower heat and cook for an additional 5 minutes. Remove from heat. Cool completely. Serve with scones, on toast or by the spoonful. Refrigerate leftovers (if you have any) and use within one week. Mix all dry ingredients. Cut butter into dry ingredients using a pastry cutter or 2 forks until the mixture looks like coarse peas. Make a well in the center of the mixture and mix in the buttermilk and vanilla until just incorporated. The mixture should be sticky. If it is not, add a little more buttermilk. Scoop out 10-12 dollops of dough (a little smaller than a baseball) onto lined, rimmed* baking pans. Brush tops of scones with heavy cream and sprinkle turbinado sugar on each one. Bake for 12-18 minutes until edges are golden brown. Remove from oven and serve warm. *Make sure your pan has a rim as the butter sometimes melts and leaks out and could end up on the floor of your oven. This could cause a fire! !